Investing right can help you make a lot of money. But in order to invest right you need the right information at the right time. There are many online investing website out there, so here is a list of 10 good ones. Simply check them out and pick the one which suits you the most! Most of these websites boast portfolio tools to allow you to manage your investments online. In addition to that they also have investing tips to help you invest in a better way! For other options, check out Discover CD rates. Wikinvest will make your online investments a breeze. Wikinvest Portfolio Manager is a complete website that allows you to take advantage to the fullest of your online investment portfolios. The website boasts a data import tool that lets you import your data from external brokerage sites to setup your portfolio account. You will be able to view all your accounts in one place and access portfolio analytical tools backed by real time data and visualizations. This site also provides company reviews and performance metrics to help you make better investment decisions. You should definitely head over to The Money School if you are just beginning out with personal finance and investing. Stock market heat maps are updated continuously to let you know what is going up and what is going down in the stock market. StockMapper is an assemblage of many heat maps that show the volatility of today’s financial markets. The stock heat maps deal with exchanges such as NASDAQ, NYSE, and Eurotrac. You have the ability of using heat maps as a ‘dashboard’ and applying filters to get the information of your choice. A 3-D map is also present. 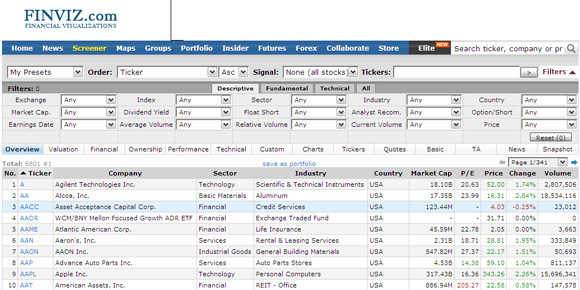 Click on the color coded stock points to display news feeds related to that specific stock or company. FINVIZ is a stock visualization tool that has a stock screener which offers many filters. You also have the ability of creating your own custom screeners and mapping it to the online portfolio for the stocks you wish to concentrate on. Saving them as presets and using them later is also possible. It supports multiple charts using which you can supervise things like different sectors, futures and forex markets and high performing stocks easily etc. Knowing how the best investors invest can lead you to become a good investor very fast. Guru Focus does not have a portfolio management tool but it guides you to choose the right stocks. 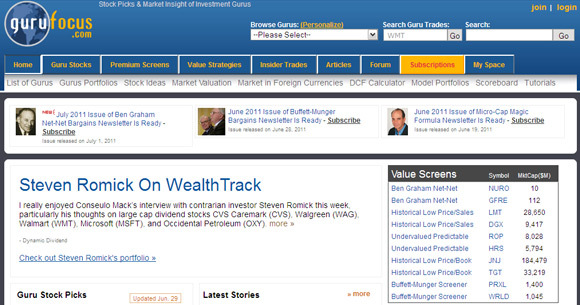 It provides investment ideas via financial news, insights, and commentaries. It is not about short term investing. Almost all its features are free except The Real Time Guru Picks, which is a membership based feature. 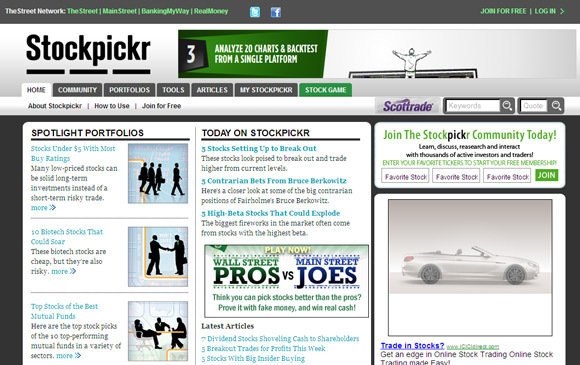 Stockpickr is a part of The Street network of financial information sites. It has also been included in the Times 2007 list of best websites. All the financial clues that this site boasts come from tracking the portfolios of various top mutual and hedge funds and super investors like Warren Buffett, Wally Weitz, and George Soros. Stock Ideas articles can be very helpful for you. Don’t forget to check out The Stock Game for simulated stock trading. Yahoo Finance is a great website that provides you with financial headlines, free stock quotes, portfolio management resources, international market data, message boards, and mortgage rates. 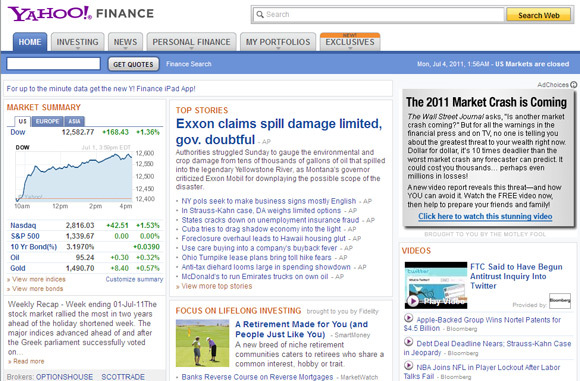 Yahoo Finance is also localized like its main portal for some major countries across the planet. A few new features are the streaming codes, smart lookup to search for quotes faster and a personal finance section etc. It also boasts the Experts panel and Money Guides tools. 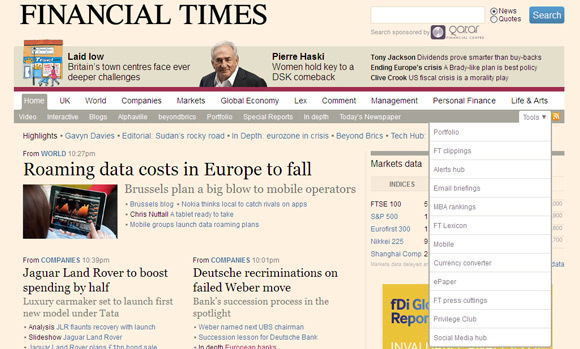 Financial Times is a very popular publication that provides worldwide coverage of the latest financial trends. It also covers regional markets such as Asia, the Middle East, and India. Do check out the lineup of tools (shown in screenshot) or the various blogs that are on the second tier of the site. 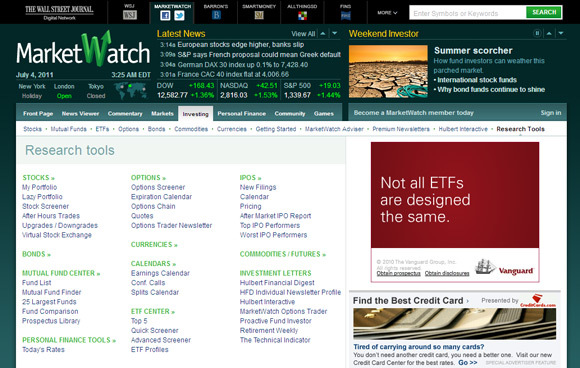 MarketWatch is from Wall Street Journal. This site provides topics, companies, people, investment aids, and markets in the news etc. Don’t forget to check out the podcasts and the Virtual Stock Exchange Game. 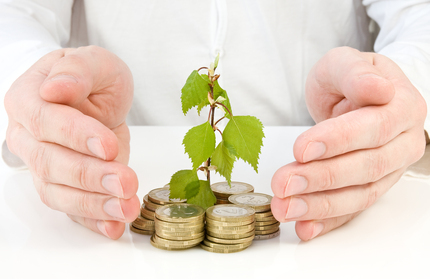 The section on investments boasts many tools that can help you out in making better decisions. For example, the list of best and worst IPO performers, mutual fund comparisons, and the other screening tools should defintely be given a try. The My Portfolio section allows you to track your investments. The Motley Fool is one of the first and most larget investment sites out there. It is an awesome source of information that has been providing stock advices to people since 1994. It will prove to be really useful for you if you know the basics. You can also get expert opinions. A very big community is also present with which you can to exchange ideas, but because there are a lot of professionals, so there is a general intolerance to very newbie questions, so do learn some basics before you starting any conversations on the forums. Investing For Dummies is an amazing resource of tutorials, investment terms and articles that will answer most of your questions. It has been written in the very typical style of the “For Dummies” books and the content is very simple and informative. Although it can not be termed as a complete website, but it is definitely a good source of information which has been divided into topics and written in a very simple and easy to understand way. So do give it a try. Which investing websites do you use? Some thoughts on how data visualisation can be misleading, especially in the context of stock trading. One for the list is Zignals.com. It offers a full suite of investing tools – these include stock alerts, charts, screener, portfolio manager, newsstreams, watchlist, pattern matcher, trade timer and strategy builder. I fail to see how you missed websites like Kickstarter and Rockethub. These two websites aren’t like stock investment, and you don’t get any equity in the business’ you invest in, but if you can spot a good deal and get limited edition items out of it, it is easy to sell them on and make a lot of profit!